â€¢ Consolidated One Piece Booster/Filter Combination with Built-In Ice Machine Scale Inhibition! 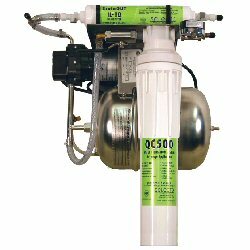 â€¢ No Complex Plumbing Between Separate Booster and Filter Components! Simple â€œWater Inâ€� and â€œWater Outâ€� Connections! â€¢ Sanitary, Quick Change QC 500 Cartridge!